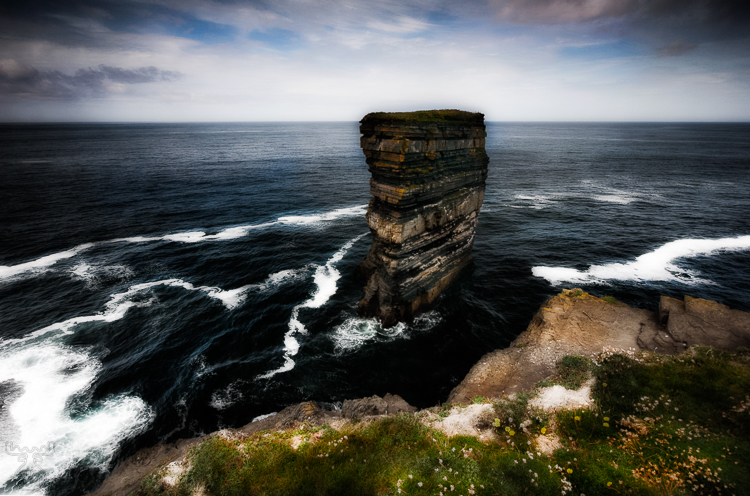 Downpatrick Head, especially Dun Briste, which is the rock column in the sea, is an amazing piece of stone. Dun Briste, standing lonesome, blasted of the mainland, shall still keep the devil, after St.Patrick had trapped him there after a quarrel - by cutting of the part from the headland. One of the pictures of my "Ireland in Art" portfolio, which are digitally altered images, which I feel do even better express the mightiness of the landscapes by less saturated colours and a high level of contrast. Digitally altered in contrast, color saturation, and sharpness.